The Minor Pentatonic Scale. This is the most used scale in rock and metal solos. Hundreds of licks come from this scale, so this is a ‘must learn’ scale. Blues Scale. This is another essential scale for rock and metal guitar. It’s very similar to the Minor Pentatonic,we just add one note. Rock and Heavy Metal Lick 1. A great lick using the A Blues Scale. You’ll find similar ideas in solos from your favourite rock and metal guitar players. This lick works fine at different speeds, it will sound awesome either way! Sliding Blues Scale and a lick from it. This scale allows you to move over the guitar neck and get a more interesting sound than if you just stay in the same area. The Natural Minor Scale (AKA ‘Aeolian Mode’). It’s similar to the Minor Pentatonic Scale but with a few added notes. The Aeolian Mode is commonly used by all rock and metal players such as Slash, Zakk Wylde, Kirk Hammett and others. Also I will show you a fantastic lick using this scale shape that will make your solos sound awesome! You can use this scales and licks as a starting point to create your solos. You can also create your own licks from the scales you will learn here and be one step closer to become a rock star! Heavy Metal Guitar Scales. Nail the essential guitar scales for heavy metal, rock and thrash metal guitar as used by all the metal and thrash guitar legends and learn 3 awesome metal licks played by all the metal guitar greats. Learn the essential guitar scales for playing heavy metal and thrash guitar as used by Tony Iommi, Kirk Hammett, Dave Mustaine, Kerry King, Jeff Hanneman and others! Plus 3 super cool licks to show you how you can use each scale to create heavy metal style licks of your own. These aren’t the only scales you need – but it’s a great place to start! This is the most commonly used scale in almost every style of guitar playing so if you don’t know it then this is the best place to start! Hundreds of essential rock and metal licks come from this scale. The blues scale is another essential scale for rock, metal and thrash soloing. It’s just like the minor pentatonic with a couple of notes added in. These added notes give it a darker, more edgy sound – perfect for rock and metal soloing. The minor pentatonic and blues scale are generally used interchangeably when we solo. Check out this essential metal lick using the A blues scale. You’ll hear ideas like this in the playing of every metal guitar player including Kirk Hammett, Dave Mustaine, Tony Iommi and Zakk Wylde. 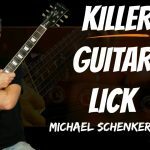 The lick uses a few essential metal guitar moves within the blues scale shape, these are cool because youcan take them and use them to create licks of your own. Metal players often play licks like this at very fast speeds! Whatever stage you’re at, practice using this lick, even if you can’t yet play it as fast as they can. Find a way to use it in your playing and you’ll soon notice it coming out in your guitar solos. You’ll build up the speed over time! This blues scale pattern is incredibly useful for soloing. It works it’s way along the fretboard rather than just staying in one area of the neck. There are all sorts of awesome metal and rock licks hiding inside this pattern so experiment and hunt them out! This lick uses the sliding blues scale pattern to create a speedy, slippery little metal lick! Watch for the position shifts, slides and the use of the blue note to give it a little darker flavour than the minor pentatonic lick. The scale pattern for the natural minor scale is like the minor pentatonic scale with a few added notes. It’s also called the Aeolian mode and is widely used by all rock and metal players. Listen for it in the playing of Kirk Hammett, Randy Rhoads, Slash, Zakk Wylde, Dave Murray and others. Use it as a way to add ‘colour’ to your basic pentatonic scale shape. Sometimes the added notes won’t work, but most of the time they will. This metal lick is coming from the A natural minor scale and uses a palm muted repeated phrase in the first part. I’m alternate picking this section of the lick. Notice how the added natural minor notes are being to used to decorate a simple pentatonic idea and give it more flavour. The next part is typical of the playing of Randy Rhoads. Again it’s using a simple minor pentatonic lick but it’s decorated with the added natural minor notes. This is a great way to build vocab with any new scale! Use these licks as a starting point for making up some of your own licks. It’s really important to do this! Change them and adapt them to suit your taste as a player. Also borrow ideas from your favourite players and see how you can use them in your own playing. This may seem a bit cheeky but it’s part of how all great players learn.